Is it a good protector? How light is it? Is it worth it? What is it? Girls do two things, lower your batting average and your bank account. Worth every penny. Not too heavy. a lot of people wear the protector on the outside of the wrist, I wear it on the inside. I second everything Goldy said up there. I fully intend on purchasing the batting glove as well (if there's an all-white color scheme). Thanks!!! I'm probably going to get the wrist gaurd. I just recently bought the elbow guard after being drilled right on the bone. My elbows pretty swolen a day later and i can barely move it above my head. A kid on my team had one and it is incredibly light and hard as a rock, so i decided to get one, and my dad had no problem buying me one. It cost a pretty penny but is worth it due to its lightness and its comfort. With it on the only thing I feel is the elastic strap. I own 3 of the wrist guards and I will not stop buying them. Stylish and functional. Only complaint is that they are very hard to clean and remove the "funk" smell out of them after prolonged use. My son wears the undershirt with the molded protective inserts. My son absolutely loves it. He will be 10 in April and we are awaiting his second shirt. First one lasted 2 1/2 years. I got one for my wrist, and like Goldy I wear it on the inside of my glove hand (sometimes). I tend to be the type of third baseman to just get in front of the ball first - field it later, so I take a beating. I guess it's the catcher mentality without the gold glove hands? I wear one on my glove hand when I catch/play third. Awkward reviving a post from 6 months ago, but has anybody tried an evoshield with a wrist strap? I'm really debating whether to get one or not because I usually tape my left wrist and I feel like it'll save me some money if I just get one. Thoughts? My only knock on them is that i sweat like crazy wearing them. Also, my white one looks pretty gross from the sweat over the weeks... I also dig the Evo Tan after wearing on all day! It's not really a protector, as it is for 'style'. I think I'm going to have to pick this up and not the Evoshield. Doesn't look bad either. Definitely increasing my baseball swag with this. Big fan of the Evo with strap. Gray digital camo works with everything. 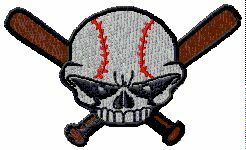 I rock an Evosheild on my glovehand high on my forearm but this is something I would wear on my right wrist. I have a pair of these kind of bands without the strap. I'm about to order the one linked above, but I think it's kinda whack to pay $6 shipping on a $9 product. Do you have a discount code by any chance?